The search for ways to build greener, more sustainable buildings has sparked a brand new skyscraper race, but these contestants aren't made of concrete and steel. 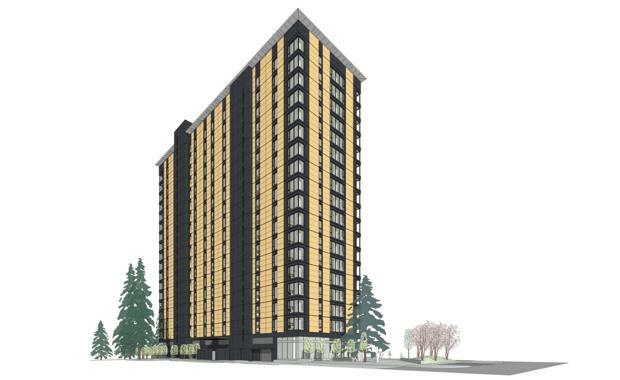 Coming first in the global green race is the Brock Commons, Phase 1, in Vancouver, Canada, which is one of the tallest mass timber buildings in the world and currently under construction at the University of British Columbia's Point Grey campus. The 18-storey student residence building will provide housing for 400 students and comprise between 300 studio apartments and 30 four-bedroom units plus social and study amenity spaces. Other candidates include recently proposed structures including a 100-story tower in London, nicknamed the Splinter, and a 40-storey building in Stockholm - but Canada's is the only under construction. Wood is still slightly more expensive than concrete and steel, but according to the University of British Columbia, there's another benefit. On top of creating fewer greenhouse gas emissions, timber buildings also store carbon dioxide. New wood engineering technology and ultra-strong bonding means it's possible to create sheets of plywood-like panels that can provide the equivalent strength of steel. According to experts, enormous, chunkier pieces of wood are largely resistant to fires and safe in earthquakes. This means they burn very slowly, then char, then in turn can 'insulate' themselves.